May 11, 1996 Nnamdi Azikiwe, the first President of Nigeria, died. Azikiwe was born November 16, 1904 in Zungeru, Nigeria. He earned a Bachelor of Arts degree in political science in 1931 from Lincoln University and a master’s degree in 1933 from the University of Pennsylvania. In 1934, he returned to Africa and became the editor of the African Morning Post, a daily newspaper in Ghana, where he promoted a pro-African nationalist agenda. In 1937, he returned to Nigeria and founded several newspapers across the country. In 1944, he co-founded the National Council of Nigeria and the Cameroons and in 1947 was elected to the Legislative Council of Nigeria. 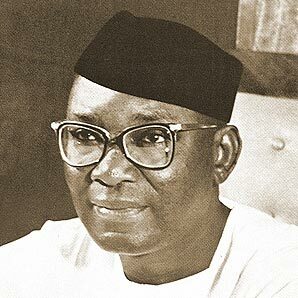 In 1960, Azikiwe became the first Nigerian named to the Queen’s Privy Council and in 1963 became the first President of Nigeria. Azikiwe was removed from office in a military coup in 1966. He served as Chancellor of Lagos University from 1972 to 1976. The Nnamdi Azikiwe International Airport in Abuja and Nnamdi Azikiwe University are named in his honor and his portrait adorns Nigeria’s five hundred naira currency note. His autobiography, “My Odyssey: An Autobiography”, was published in 1971.